The PR firm 30 Point Strategies has discussed how to combat BDS at the University of California, Los Angeles campus with Hillel staffers there. 30 Point staffers have advised UCLA’s Hillel to stay largely silent in the event of a student government resolution that recommends divestment from Israeli military-linked corporations. “You are in excellent hands, and Hillel International and 30 Point will be behind you this semester,” wrote 30 Point staffer Arielle Poleg in a September 23 e-mail to Rabbi Aaron Lerner, UCLA Hillel’s senior Jewish educator. The revelation that a Hillel chapter has turned to a professional public relations firm shows that UCLA Hillel is stepping up its work to fight BDS on campus. The BDS movement has sparked intense, often vitriolic, debate on campuses around the nation. 30 Point, a public relations firm populated by former journalists, has deep ties to Washington. Before joining the firm, Poleg directed the Israel Action Center at the Jewish Community Relations Council that serves Washington, D.C., Maryland and Virginia. Noam Neusner, a principal at the firm, is a former speechwriter for President George W. Bush. Neusner is also frequently identified in the press as a “spokesman” for Hillel International, the umbrella group for Hillel chapters. The exact nature of the relationship between Hillel International, UCLA Hillel and 30 Point is unclear, though. “30 Point Strategies does not comment on its client work,” Josh Silberberg, director of media at the firm, told me. Hillel International, the umbrella group that is the main address for Jewish student life nationwide, is staunchly opposed to BDS. The organization’s guidelines for which speakers chapters can bring to campus and what organizations they can partner with have barred BDS advocates from Hillel spaces. Those guidelines led some young Jews to create the Open Hillel movement, which advocates for the changing of Hillel’s policies on discussing BDS and other issues. UCLA’s student government has not passed a resolution recommending that the UC Regents divest from Israeli military-linked U.S. corporations like Caterpillar, which sells bulldozers to the Israeli army. Earlier this year, a divestment resolution failed to pass at the school by a 5-7 vote. But it is likely that the Students for Justice in Palestine chapter at the school will push for a divestment resolution again this year. Five student governments have already passed pro-divestment resolutions in California. UCLA Hillel has given money to student government candidates that pledged to fight divestment resolutions. In July, The Daily Californian broke the story of how Adam Milstein, a right-wing pro-Israel philanthropist, had donated to UCLA Hillel so that his money could go to anti-divestment student government candidates. Hillel “can see the writing on the wall…They don’t want to have a huge defeat on divestment. They’re thinking about trying to lessen the blow of it,” said Gabriel Levine, the co-founder of UCLA’s Jewish Voice for Peace chapter. JVP’s attempts to become affiliated with UCLA Hillel were denied because of the organization’s activism for Palestinian rights and support for BDS. 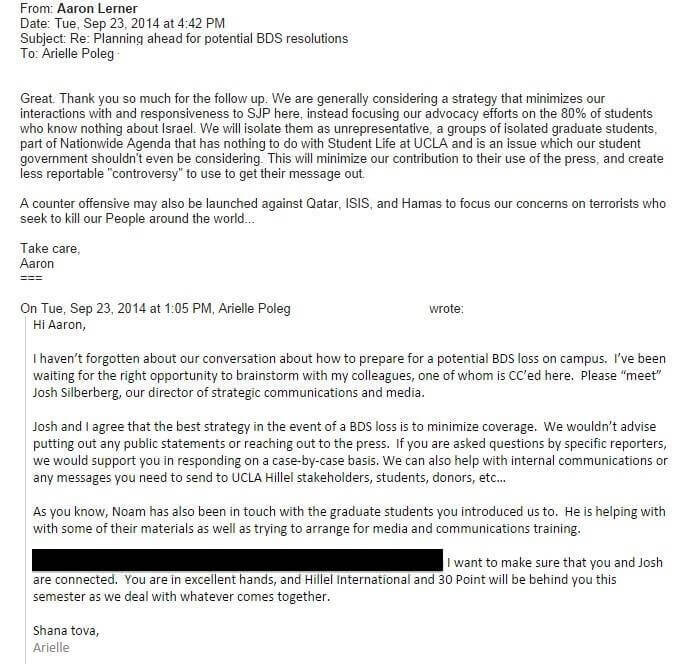 In the e-mails to UCLA Hillel obtained by Mondoweiss, 30 Point’s Poleg wrote that “Noam”–probably a reference to Noam Neusner– “has also been in touch with the graduate students you introduced us to. He is also helping with some of their materials as well as trying to arrange for media and communications training.” That e-mail is likely referring to some graduate students’ efforts to stop a UC-wide student union, United Auto Workers 2865, from passing a divestment resolution this year. Anti-divestment graduate students have created a website dedicated to stopping the BDS effort at the union.